At the tenth floor of the hotel Neboder in Rijeka Bora is playing nice tones, sometimes as a soft flute, sometimes as a deep trombone but always as a nice orchestra! Strong north wind that is blowing from the land to the sea, when cold wind from the mountains starts blowing towards the sea. Bora starts strong, lasts for few days and calms slowly. First day of the 53rd Festival was all about the opening ceremony and first official screening. Participants of the Festival gathered at Art-cinema Croatia in Rijeka where the first screening in general was held far back in the early 20th century and is redecorated and reopened in December of 2008. It is serving as a center for the Festival and will host all screenings and discussions with authors. Amongst selected films, 35 are animated, 25 fiction, 15 TV reports, 11 films are in the open category and only five are documentaries! In the past it was the main genre, and today it has almost completely disappeared from the focus of school film groups. Member of the professional jury, Maja Flego, consular at the children's ombudsman office, thinks that there were food ideas but they weren't done right. Themes were usually unusual individuals in unusual surroundings, especial athletes, musicians or other filmmakers. There was an interesting subcategory dealing with children with disabilities and their needs. Some documentaries were qualified as TV reports or films in the open category which means that sometimes even the authors are not sure what they're filming. If it's good and of quality, sometimes it's forgiven to be wrongly labeled. Čejen Černić, film and TV director unites both experiences. She used to participate as an author, back in the time when elementary school students and students from high school compete together, and was disappointed when her first film didn't make the cut. Today she is the member of a jury and is deciding on what goes and what doesn't. She is aware of big expectations; she has to and wants to commit to her criteria. She values authentic and creative approach and she doesn't like when children in fiction films don't commit to their parts. Seeing that students made the film and adults were only advising makes her happy. Mentoring is always a balance between respecting the students, trusting them, encouraging children's creativity, guiding them and criticizing them constructively, she says. Speakers during the presentation of a double issue of Croatian Film Yearbook were film critic and a member of editorial board, Diana Nenadić, doctorant in film Mirela Eamljak Purgar and chief editor Silvestar Mileta. They presented their point of view of the Fritz Lang classic Metropolis, filmed in 1927 as well as other interesting subjects. And the ship is, of course, rocking! Even though it is firmly docked in the Rijeka port, first Croatian boatel Marina was built way back in 1936 in Denmark and is transferred to Adriatic in 1968. 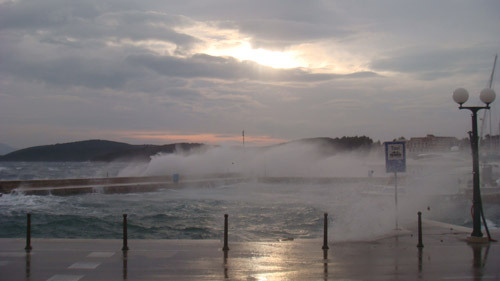 It is rocking because of the stormy sea and it more evident at the bottom dock whose round windows are only few centimeters away from the sea. That creates a special unforgettable feeling for inlanders even though people from Dalmatia and Prigorje are not completely stabile. What's interesting is that the ones that are at the boatel want to be in a hotel and the ones in a hotel want to be on a boatel. It is hard to please human nature! Tomorrow, Bora will quiet down, both sides will exchange impressions and the Festival in Rijeka, that is held in this city after 29 years, will be remembered for a long time. For good, of course!